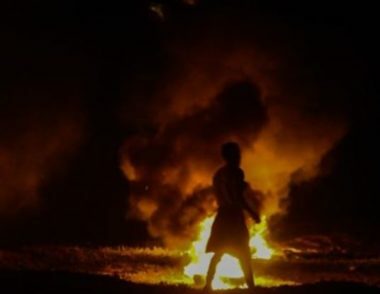 It is worth mentioning that dozens of Palestinian youngsters held the protest at night, along the perimeter area across the eastern part of the Gaza Strip. On Wednesday at night, Israeli soldiers killed two Palestinians, identified as Ra’ed Hashem Hamdan, 21, and Zeid Emad Nouri, 20, in the northern West Bank city of Nablus. On Wednesday evening, the soldiers executed a young man, who stepped out of his car and tried to provide aid to a Palestinian, who was shot and seriously injured by the soldiers in his car, while his wife and children were also in the vehicle. The slain young man, identified as Ahmad Jamal Mahmoud Manasra, 26, was driving behind another Palestinian car, when the soldiers shot and seriously injured the driver, who was with his wife and children. On Tuesday at night, the soldiers killed a young Palestinian man, identified as Omar Abu Laila, 19, who is suspected of killing two Israelis, last Sunday; the Palestinian was killed after the soldiers surrounded a home, and exchanged fire with him in Abwein village, near the central West Bank city of Ramallah.